But it’s still as hot as ever. Sometimes when I am sitting in the a/c I forget it’s so warm out and I think about getting a hot chocolate during my lunch break at work. Then I remind myself that I live in South Florida! Yesterday I tried something new during my run. I recently spoke with someone who runs around my pace. This person just finished her fifth marathon in 5h 53min and never hit the wall. I quizzed her all about her training since I want to run 5h 59min or better at Miami. She followed the Galloway method and actually did 30 sec run / 30 sec walk for the whole marathon. The Hansons method doesn’t look favorably upon run/walk intervals so I mostly cut them out of my training over the summer. Some days it was so hot/humid that I used them because I was huffing and puffing even at my ridiculously easy pace, but mostly I phased them out. Prior to Hansons when I used run/walk intervals I would usually do 2 minutes run / 1 minute walk or 4 minutes run / 1 minute walk depending on what I was training for. When I achieved my current half marathon PR at the Miami Half Marathon I used 2 minute run / 1 minute walk intervals so that’s definitely a formula that works well for me on longer runs. I have been thinking about re-introducing run/walk intervals into my training since the Hal Higdon plan allows for them. 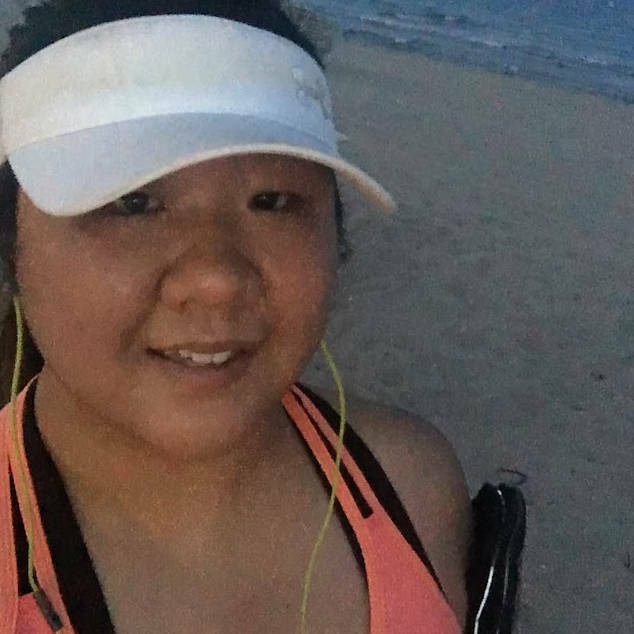 Last night when I got to the beach I decided to try the 30/30 intervals that worked so well for the runner I spoke with the other day. I’m glad I tried it because now I know that I don’t like it. Thirty seconds just wasn’t long enough for me to feel like I got into any groove running. My average heart rate for the run was 155 so I guess the shorter intervals really helped me keep things easy, but it just didn’t feel comfortable. I was honestly pretty relieved when I was done. Perhaps one reason I wasn’t comfortable was because my calves were so tight. I don’t know if the shorter intervals had anything to do with it (probably not) but my calves never loosened up. Story of my life! Hah! 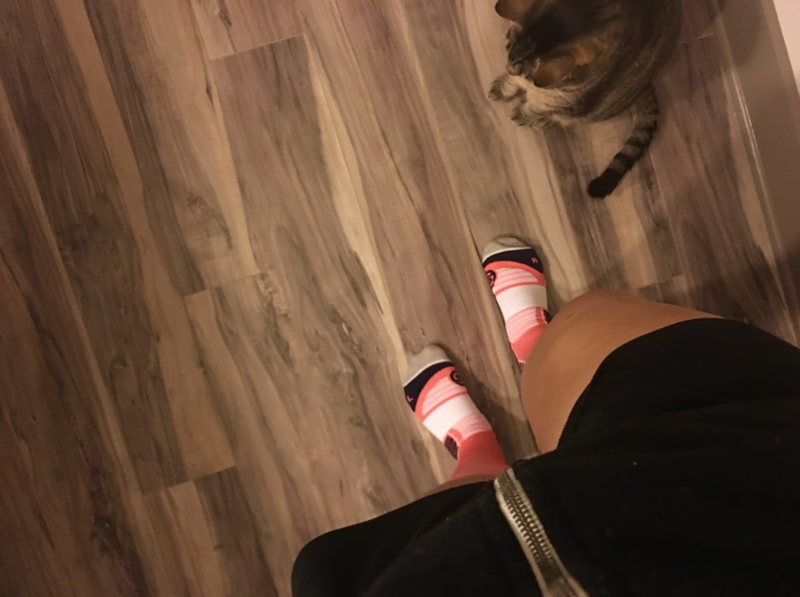 When I got home I put on a pair of activewear socks from SKINS. 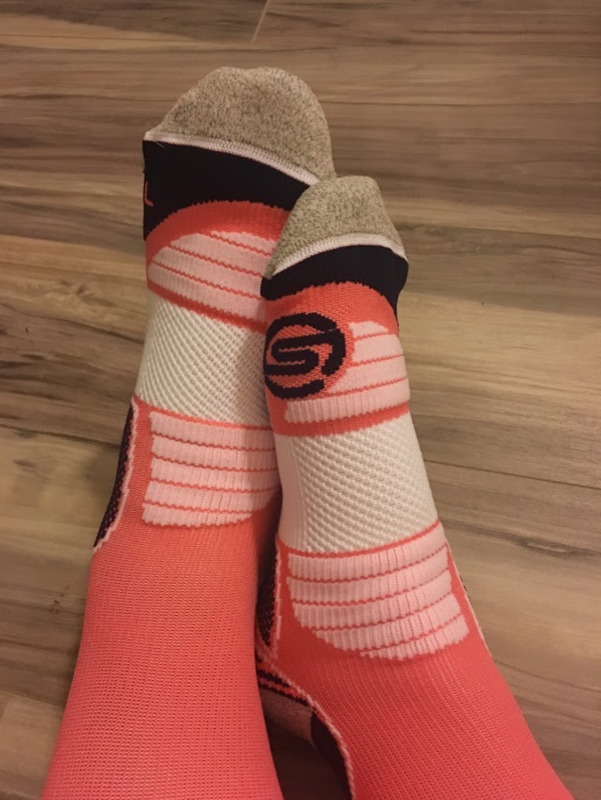 These beautiful socks are actually on sale right now for only $25! Mine are in the Pomelo/Midnight color. I also love that Skins supports animals and kindly made a donation to my Team PAWS fundraiser to help save the lives of homeless cats and dogs :). My little shadow, Cecil, approves too! I’m going to switch back to 2 minute run / 1 minute walk intervals tonight and see how that feels. I think that’s what I will use for Miami Marathon training. I like 4 minute run / 1 minute walk intervals and even 9 minute run / 1 minute walk intervals for shorter runs, but for the marathon I think I better go conservative … this time anyway. You never know what the future holds! If you use run/walk intervals, what intervals do you prefer for longer distances? What was the high temp for you yesterday? What’s your favorite hot beverage to drink when the weather cools down? I like a nice hot chocolate with whipped cream on top! If that method helped you set your PR then I think its a great idea to give it a try! I don’t think I would like 30/30 intervals either. You would have to constantly be thinking about when to stop or start running! Do you know I have NEVER had a pumpkin spice latte … or a pumpkin spice anything?! I don’t like pumpkin so I am worried that I would really dislike it! I don’t use run/walk consistently through my training, but I will use it on occasion, usually on recovery days. I usually do 4:1. I like it for recovery days because the walking portions let me evaluate if I am just feeling normal soreness from a hard run or if something is feeling injured. Ohhh I like that! It is a great way to evaluate if something is off. I’ve never really thought about that, but walking does force you to refocus if you’ve been zoned out during the majority of the run! Oh mannn, can I come be your kid for a week in the fall/winter? I’d get to experience nice, cool weather and I’d get to drink your hot chocolate? Sign me up! I don’t run/walk a lot but I have before and my first initial thought about 30 sec/30sec was exactly what you thought- totally not enough time to get into a rhythm! Coffee is def my go to hot beverage, but I drink iced coffee a lot in the winter too! I enjoy iced coffee too but I feel pressure to drink it fast because I hate when the ice melts and the coffee is watered down! I usually drink hot black coffee and I love when the weather gets cool enough to drink it all the time! 🙂 I am wishing you cool, true fall weather soon!! At out running club we train using the 10 min intervals. Run 10 mins, walk 1 min. It really helps to break down the run or race. Training for the ultra I’ve had to embrace power hiking. Run the flats, power hike the climbs, and run the downhill. Don’t think that helps because it’s pretty sporadic lol. High temps around 99 but I can see the light at the end of the tunnel. Its been low 70’s in the morning, gorgeous! I run intervals, and I pretty much base it on how I’m feeling. I go anywhere from 3/1 to 20/3 and lots of places in between! It also depends on if I’m running on a treadmill, running hills outside, the temperature, etc, etc. 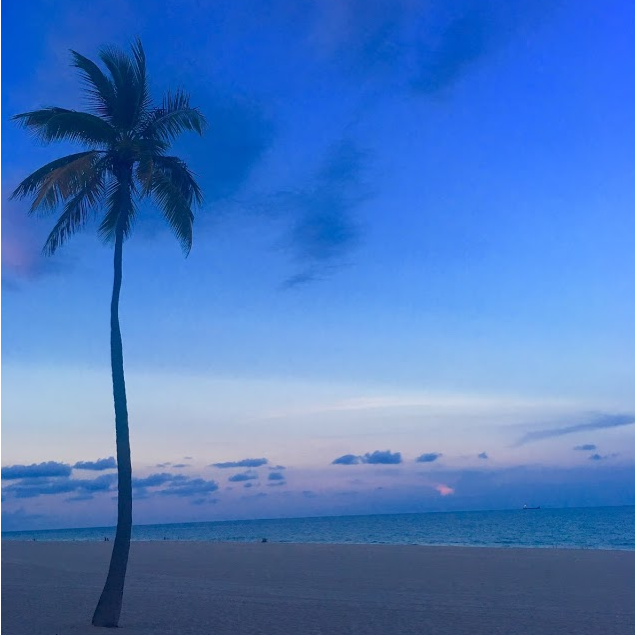 Speaking of – I’m in Florida for the week for vacation (I live in Kentucky) and my husband and I are running a 5k (his first, my fourth), and I didn’t want our first Florida daytime run to be the day of the 5k, so yesterday morning we did our last training run in the morning, 8:00ish. Holy heck, how do you do this on a regular basis?? 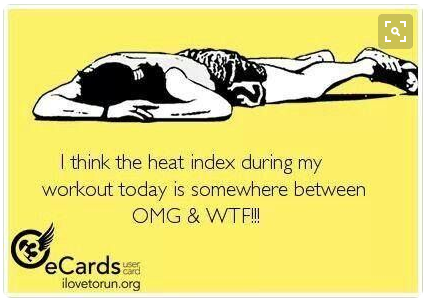 It was SO hot and humid – and it gets hot at home, for sure, but not like this! 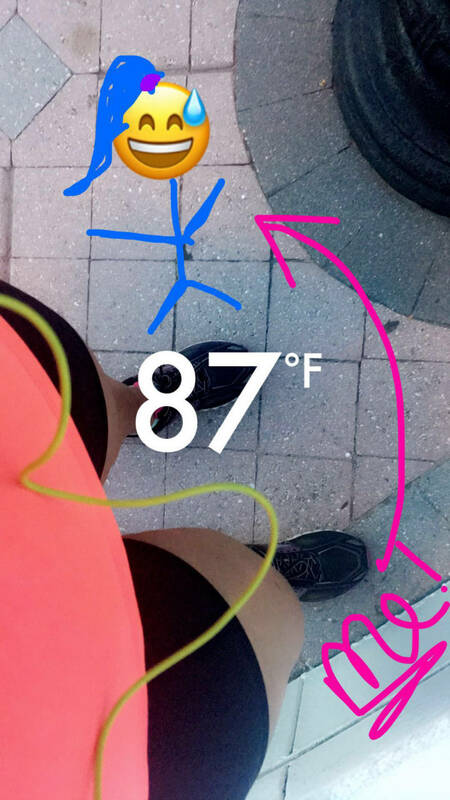 I’m glad I’m doing this 5k with him, because I’d be so off my PR, it would be embarrassing! I love the socks!!!! I have been wanting to practice different ratios but I have not done so well actually doing it. I did like 3 x 1 when it was super hot. but I do go a bit slower ( about a minute a mile) at that ratio as opposed to 4 x 1. I remember when I first started running and I did 30/30 and it sucked. I just never find a groove and I get side stitches! But I do like 60/30 or 120/30 sometimes. I haven’t used intervals in awhile but I think I maybe should have this summer at certain points. I think run/walk has worked well for you in the past, so using it for your next full would be a solid plan!